^ July Greg Maddux 1988 Pitching Gamelogs - Baseball-Reference PI 2008年1月10日閲覧. ^ 1993 NL Championship Series - PHI vs. ATL - Baseball-Reference.com 2008年1月10日閲覧. ^ May 28, 1995 Atlanta Braves at Houston Astros Box Score and Play by Play - Baseball-Reference.com 2008年1月10日閲覧. ^ Single-Season Leaders & Records for Won-Loss % - Baseball-Reference.com 2008年1月10日閲覧. ^ Baseball Awards Voting for 1997 - Baseball-Reference.com 2008年1月10日閲覧. 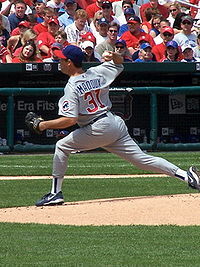 ^ Greg Maddux 1998 Pitching Gamelogs - Baseball-Reference PI 2008年1月10日閲覧.